Diaper rashes can be tough to deal with. Knowing what kind of cream to buy is twice as hard! As a careful parent I find myself checking the ingredients out and always looking for products that are safest for my children. 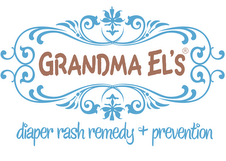 Grandma El's diaper rash remedy + prevention contains proven safe and natural ingredients. Ingredients like vitamin E and lanolin help to soothe the affected skin and allow it to heal because this special formula allows baby's skin to breathe. This pediatrician tested and approved ointment has no parabens, SLS or pthylates in its formula. I have used Grandma El's for about three weeks. We have used it on diaper rashes, small scratches, cracked heals, dry cuticles, chapped lips and even razor burn. There are so many uses! This ointment is creamy and smooths on without being greasy. There was no real smell that I noted, it is pretty much completely unscented which is perfect for sensitive skin. When applied this actually stopped the pain of my baby's rash. His bad diaper rash was cleared up within 24 hours, I am impressed.